Who is selling more gear: Oregon or Ohio State? The first ever College Football Playoffs will come to an end on Monday night when the Oregon Ducks take on the Ohio State Buckeyes in Dallas, and it seems the entire country is looking forward to watching the contest. 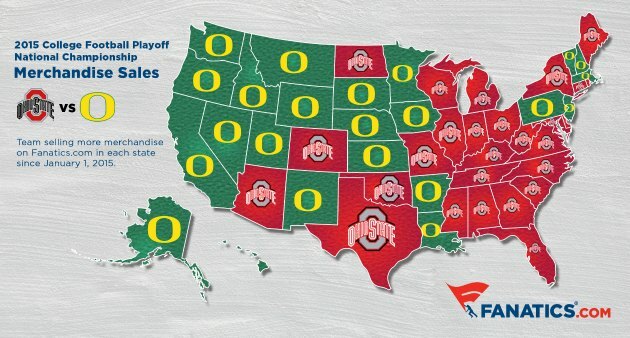 A new map from online retailer Fanatics.com splits the country between the two teams by showing who sold the most gear in each state since the teams punched their tickets to the championship game on New Year's Day. The website says it has sold gear for both teams to all 50 states in the last 11 days, with Ohio State outselling Oregon in 27 states for a slight lead over the Ducks. Oregon did receive a bigger boost in sales than Ohio State did when this year's sales are compared to the same period last year.